Meet Tim Davies, Practice Director UI / UX. Tim joined Tquila in July 2012. Want to hear more from the people in the video? Follow them on Twitter! In order of appearance: @tquila_wes, @eoin_tquila, @laura_tquila, @sarah_tquila, @tquila_kc, @tquila_becci, @jaysenmoita, @tquila_james & @wendfu! You know we love Salesforce – and we’re very proud to have pioneered the ability to work with Salesforce when you’re offline, on your iPad. Ever wondered how easy it really is to use Tquila Anywhere? Check out our nifty new video and see for yourself! Interested in seeing Tquila Anywhere in the flesh? Get in touch! We’ve appointed a new CEO! We don’t blog about it a lot, but the Tquila team is continuing to grow. Our hire is Alistair Wildman, who’s been appointed our new CEO! Alistair was most recently salesforce.com’s UK SVP of Enterprise Sales – and we’re delighted to welcome him to the team. His experience and passion for driving business transformation through mobile and social innovation mean he’ll fit in nicely with the Tquila team! Our former CEO Paul Andrew will remain closely involved with us. He’s retaining his role as Chairman, and will continue to fly the Tquila flag for us around the world. A few more thoughts on Movember from Tquila’s team captain, Simon Parker. Well Movember is nearly at an end – how time flies. It’s been great taking this journey with colleagues, family and friends. Starting from the initial stubble of the first week, moving to the ‘it’s definitely starting to show’ phase and then the inevitable ‘Does it itch?’ and ‘Bet you can’t wait to get rid of it’ of the final week. Doing it as a team at Tquila has provided many a moment of conversations and jokes, as well as giving opportunities to raise the awareness of men’s health and the fantastic work done by the many charities supported through Movember fundraising. It’s also been a bonding activity – we’ve helped each other through the hard times, stood together in the face of (mostly female) colleagues’ ridicule and risen above it, emerging stronger and better for it. OK, so it’s not like running a marathon, or climbing Mt Kilimanjaro – you just don’t bother shaving your upper lip for 30 days – but it takes commitment and dedication. You have to put up with itching, hairs in your mouth, food, beer and soup getting caught in it – don’t mention the porridge – and the looks, the stares… but then now and again you catch the eye of a fellow Movember participant across a busy office, stroking their mo, or of a complete stranger on the platform waiting for a train, and with a grin and nod you acknowledge each other with mutual respect and admiration for the commitment – and it makes it all worthwhile. Will I miss it when it’s gone? – no, not the mo, but I will miss the bond that joined us together for those 30 days. But the memories will remain… along with the stubble in the sink. Haven’t got round to donating yet? That’s ok! You still have time, you can donate here! Here at Tquila Labs we have a few brand-spanking new mobile apps that we’re showing off, let me whet your appetite by telling you about Tquila Loco for iPhone. Our team has built an incredible location-based app that lets you check into your Salesforce Accounts, Contacts or Opportunities using Chatter and your iPhone’s GPS – think of it as foursquare for Chatter. We’ve thrown some gamification into the mix too taking user adoption to a nearly addictive level! Internally we’ve been using the app with enormous success. We have people working all around Europe and now it’s easier than ever for them to know who’s nearby, often letting them draw on the skills and connections of one another. What does this mean for the bigger picture? Sales close quicker and our network of knowledge is better lubricated, business couldn’t be better! If you’re in or around London and would like a demo just let me know. Meet Jane Forrester, our Head of the Project Management Office. 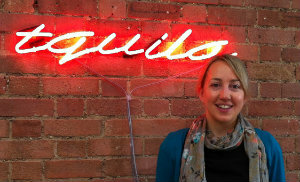 Jane joined Tquila in February 2012. When she’s not making sure all our Developers are working hard for our clients and refining our processes she is training to run a half marathon! Cloudforce & Cloudstock: It’s a Social Revolution! Managing Consultant Steve Aitken gives his take on Cloudforce & Cloudstock London. The social enterprise was again the resounding message at Cloudforce London on Tuesday! Although George Hu’s keynote didn’t ring to the sound of new merger & acquisition activity, or step change enhancements, it was comforting to see that salesforce.com continues to boldly drive the Social Enterprise into the mainstream. Salesforce.com is certainly putting its money where its mouth is when it comes to the social enterprise and continuing to heavily invest in social features such as Chatter messaging, screen sharing and continual enhancements to the social platform. There are early forays into gamification for performance reviews using Salesforce Rypple. The demos showed Rypple more tightly coupled with chatter and Salesforce than I have ever seen previously! It looks as though this has really taken shape over the past few months. Radian6 is definitely attracting interest with several existing salesforce.com customers not just “kicking the tires” around Radian6 but asking to see under the hood. There is some serious interest in this product as customers see the value it provides in cultivating leads, monitoring their brand and servicing their customers (amongst many more). Throughout the keynote and breakout sessions the “social front office” was alluded to over and over again. It appears that salesforce.com is softening its tone on SAP and accepting that in larger enterprises SAP is there to stay (in the short term anyway)… but only in the back office. This appears to be a strategic move to open up a larger enterprise market. If salesforce.com can get a foot in the door then it can chip away at the old guard, demonstrating it’s ease of configuration and rapid deployment, scalability etc. What’s more, it helps to position chatter as the social glue to bind the offerings together. Salesforce.com truly lives their message that “we’re living in a post PC Revolution” with its beta release and continual investment in Touch, it’s HTML 5 mobile solution. Watch this space! Want to hear more from Steve? Follow him on Twitter! With barely time to get my feet under my desk, Cloudforce & Cloudstock were an incredible way to kick off my role @ Tquila! Marketers are coming to realise that going social is much more than just maintaining a Facebook page or Twitter presence. Becoming social is about listening, engaging and responding to both internal and external audiences. As a marketer, this is great – means better access to more information, and a clearer perspective on what’s going in with your clients, prospects and colleagues! Enough said, really. Missed out on seeing it in person? Check out the videos on salesforce.com’s Facebook page. I’ve been dying to get my hands on Radian6 for a while now – so using it on our booth was a real winner! Thanks to a quick tutorial from a product expert, we were up & running in minutes, showing live streams for #tquila, #cloudforce & #cloudstock on one of our booth monitors. Sure, I’m a marketer – but I love working with smart developers, too. Cloudstock was crammed with the best & brightest technical minds – and loads of them dropped by the Tquila hackspace for a chat and some jellybeans. You could barely take a step without seeing something orange, whether it was your coffee cup, the jellybeans, or speaking about what the Tquila team do best. Want to hear more from me? Follow me on Twitter! What is now more than clear is that the social enterprise message is here to stay, and in salesforce.com are really serious about it! I like how they made the stories flow around the theme, and rather than focusing on product features, they focused on the best they have to offer: Satisfied consumers for their satisfied clients (with a few very cool demonstrations on very cool features, I must say). Impressive! The community keeps growing in Europe, and that is great news! It has been great to spend time with some of the 15000 attendees and hear from them about their challenges, their successes and their innovative ideas! Looking forward to working in detail with a few of them soon! I only had the chance to go see Vincent Spehner present FormStorm to the world, and what a great presentation he did. I managed to speak with a few of the people who attended, and one thing is obvious: he created some interest around the product. I can’t wait to see it “on the shelf” very soon and start using it with clients!! Awesome! That was so much fun! Tquila sponsored a “Storm Trooper” to spend time in our hacking desk @ Cloudstock. And it definitely managed to attract some attention! I am really looking forward to Dreamforce 2012 and Cloudforce London 2013! Want to hear more from Andrés? Follow him on Twitter!